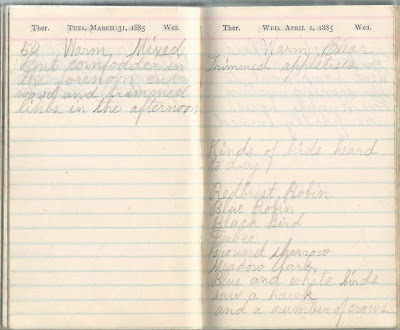 1885 diary of a farmer, presumably male, from the Dunstable, Massachusetts, area, judging from clues in the diary. Also mentioned are Nashua, New Hampshire, and Tyngsborough, Massachusetts. At the end of this post you'll find an alphabetical list of people mentioned and images of all of the pages. The diary measures approximately 4-3/4" x 3" and is filled with mentions of various farming activities at the farm and the "new farm", as well as Temperance meetings and a few personal observations. He mentioned going to Church both morning and evening on many days, and he served at least for a time as a sexton. He mentioned a horse named "Gil". 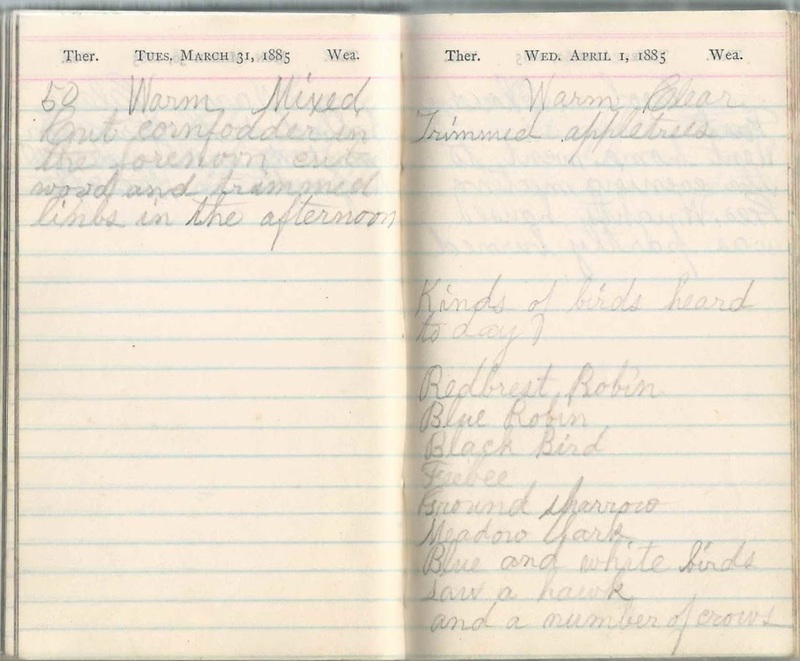 And he was apparently a bird lover, judging from the entry for April 1. Hopefully the clues above and below will help a reader identify the diarist. I think he might be Jonas Chiles Kendall, or connected to him. 4 of the 6 possible family members you mentioned match. I didn't find Charley or Aunt Mary. You said there were multiple entries for J.C. Kendall. Would they fit being the diary's owner? on the line above him is Childs Kendall, 81, retired farmer, with a wife Susan T, 78. The man's name might have been Chiles Kendall, seen in other records. This page at rootsweb says that Chiles' parents were Jacob Kendall and Elizabeth Cutler. Their other children were Olive, Sarah, Elizabeth and Elmina. This page at rootsweb says that Chiles/Childs' wife was Susanna Taylor. 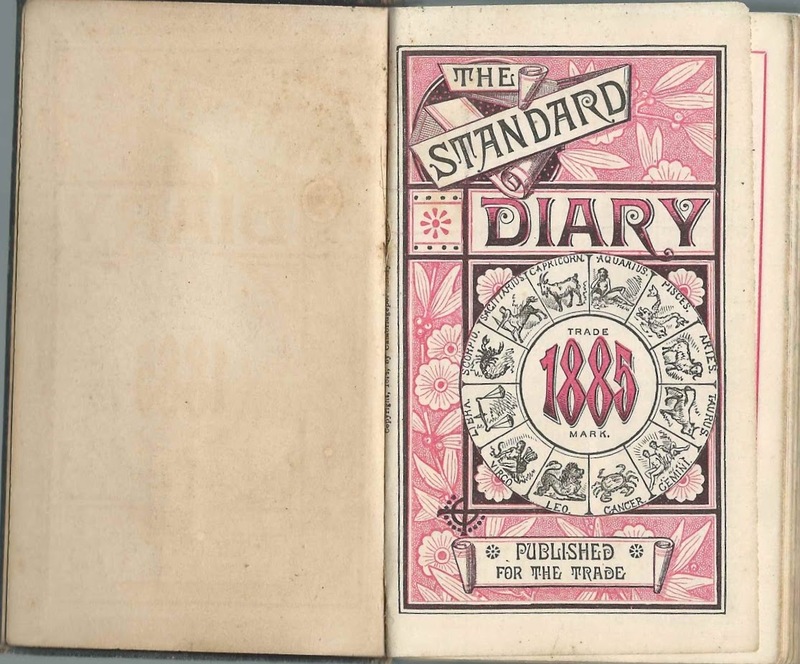 If you had the 1887 diary, it would clinch it. Deacon Chiles Kendall died Nov 16 of that year. 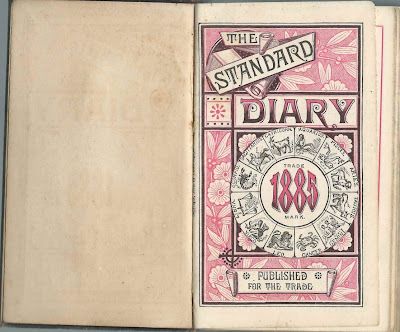 I've sent you a link to the entire diary, There are some pages in the back that seem to imply that J.C.K. was paying him, but could be a Kendall relative, possibly son James - he would have been pretty young but kids were pretty advanced back then, responsibility-wise. Would he have referred to his father as JCK rather than Pa? I really appreciate your help here and look forward to your impressions after you've had time to digest the diary. Well now I don't know. The only other family with some of those names is that of George Farnham on page 5. He has a son Fred and daughter Carrie, but no Annie or Charlie. But he is the only Farnham in Dunstable, and the when the writer of the diary says he "went home" it sounds like he went to his parents. One time he added, 'Aunt Sarah and Aunt Mary were there'. Most of the times that he records receiving money of J.C.K. are in the fall, and the one in June was when he had been jobbing, if I remember right. But I don't know why someone would record it that way if he was talking about money he earned. Unless he was keeping track of money he put into a household fund, or saving up to pay off Mr. French. He never recorded money from sales of produce, but it sounds like he had cash crops. 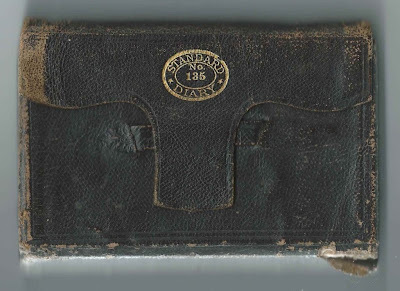 An interesting diary, I wish I had one from my great grandfather or so, in the 1880's. I don't know why the family let it go.